And at Hong Kong International, there’s some sort of fat pink alien spacecraft! Thanks to Mako, foo and Marco. The first one looks like it must be some kind of training prop. I would say perhaps for firefighting but it does look rather close to a runway for that. Also, go due east a little way and there’s a nice shot of a Concorde being towed. They are both Fire Training Aircraft. The firefighters will set them on fire and then put them out. Alex, I’ve done a lot of research and I think those might be fire training aircraft! And that first one is at heathrow airport. Don’t you think it looks like Thunderbird 2? I checked hybrid mode and the other one is at hong kong international airport. Go me! Oh, wait, I might read what you wrote now…. You lot have all been stabbing in the dark. I talked to a mate and they are training aircraft used by the fire services. Here are two pictures of the fire training rig. It looks like they tow it to other parts of the airport before setting it on fire. You know, I’m not sure. But I think they may be fire training air craft. Just a wild guess though. i think im gonna take a shot in the dark here…but i say they are fire training aircraft. I change my answer. These are clearly Flying Car testing grounds. Actually Chris, I’m a native Dutchman, and a professor in Dutch Linguistics at the University of Holland, and that text actually says “FIRÃ‰ TRAÃŽNING” which in Dutch means “Children’s Play Area”. So these aren’t Fire Training (as I think one or two of you might have suggested) but Children’s Play Areas. No, you all Wrong! I know the Answer! They are… ( suspance ) … Fire training Aircraft!! Hm no i dont think so … i think they are some kind of fire training aircraft … or a playground … not sure about that o.O maybe they just light them up for fun … that would combine these two excellent theories keep guessing guys! hagrid left his pencil at luton airport. i’m dutch and i know for a fact that it’s not even remotely true. it just says “fire training” in english. period. the university of holland doesn’t even exist. has anyone found one of these in flight? They all look fat because the wings are missing- it is just an optical illusion. the pink chinese craft may be a drone or testing aircraft. Am I the only one that finds wooden stands slightly dangerous? yes alex, seriously. do you think “children’s play area” would actually make any sense? plus, dutch rarely uses accents, so â€œFIRÃ‰ TRAÃŽNINGâ€ would obviously be wrong. everything from beginning to end in that post is total bull. Were you born this painfully serious, or did it take years of training in the University of Holland to get that good? I went to the University of Holland and I know for a fact that they don’t offer the “Painfully Serious” major. I have been on the one at Stansted airport… wosrt holiday ever! No really, it was a school trip (I lived locally) they are little more than shells and have remained unchanged since I visited over twenty years ago. …very strange that they are landing this close to each other, however, I think this must be an artifact of the high-altitude (satellite) imaging process. If you look very closely at the insignia on the side of the plan (hard to see from the top, I know!) all four planes appear to be have the same insignia (Air Italia, maybe?) 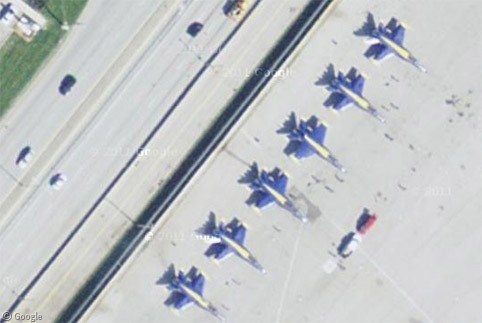 which leads me to believe these are all the same plane in some sort of sequential photo exposure. great find on the time lapse steve, thats very cool! Actually brendwal the training planes ARE fat in real life. They are made of great big metal cylinders that can be set on fire on a regular basis and are considerably bigger and more rotund than most real planes and because they only need to resemble a plane, not actually be one, they are not at all aerodynamic. Trust me, what you can see from Google Earth looks pretty accurate to me. I am fairly sure the first one is an L1011 fire training facility. maybe it’s a missile supported by china mainland. They’re not fat, you guys. They’re just big-boned. nightlurker: you mean this crazy thing right! haha you are all wrong the green plane is a boeing 727 which yes is used for fire training, the white plane is (wait for it) a 737 now this plane is actually used for anti terroist training, hostage, bombscare, and also used for evacuation training, the red small thing is actually called the x55 it was used by the americans to test their 1st rocket engine. i am a true god in the aviation world all yee who try to challange my power will be classed as unworthy….. I don’t think these are fat planes as such, just normal planes with the ends of their wings removed. Anyone notice the landing 747 on runway 18 right at Amsterdam appears to be materialising just before landing. When did Boeing supply cloaking devices for their 747’s? I think we should be told. I’m sorry I missed out on this topic last year! I missed minutes of fun! Here’s another “fat plane,” with numerous other planes around it, at Bruntingthorpe Aerodrome.